The last unbeaten sides in cricket’s Northern Premier League remain so after top two Blackpool and St Annes played out a thrilling tie at Vernon Road. Chasing Blackpool’s 170-8, the hosts had reached that total when they lost their final wicket with four balls remaining. Blackpool were put into bat and struggled to cope with strike bowler Jamar Ifill, who dismissed three of the top four on his way to figures of 5-21, his best in the competition. Josh Boyne at number three put up most resistance before falling to Ifill for 50, his fourth half-century of the season. He was one of three Blackpool players caught by Henry Higson. Another was Andy Furniss, who hit 34 from 43 balls, 26 of his runs in boundaries. Mohamed Nadeem with 44 and Tom Higson (41) led the St Annes reply but Matthew Grindley was not to be denied a major say on his return to his old club. The former St Annes skipper took 4-55 from 15 overs and professional Jovaun van Wyngaardt 3-35 from 12.2. One extra bonus point from the match saw St Annes cut Blackpool’s lead in the table to three, while Garstang are three points further back after their 20-run win at Chorley. Garstang reclaim third spot from champions Netherfield, who held on for a draw at Morecambe. After their bright start, Fleetwood have slipped into the lower half of the first division after back-to-back defeats, the latest by a crushing 98-run margin at Leyland. The hosts chose to bat at Stanning Memorial Ground and piled on 219-5, thanks largely to the second-wicket double-act of Tom Reece, whose 78 included 10 fours, and Umar Waheed, who hit 11 in his 79. Both fell to Alex Ryder, who finished with 3-62 from his 13 overs and took a catch. Joe Bell bowled only four overs but claimed the other two wickets, while Sam Bell had five maidens in his 12 overs. But the bowling star of the day was Leyland’s Karl Cross, who dismissed five of Fleetwood’s top six and finished with 5-46 from 15 overs as Fleetwood were all out in 38.3 for 121. Fleetwood’s top score of 22 was shared by three players: Jeremy Davies, Joe Bell and Ryder. Fleetwood fared far better in Sunday’s Readers T20, making the most of home advantage in the second round of matches to defeat St Annes and Blackpool at Broadwaters. They first defeated St Annes by 47 runs after choosing to bat and setting a target of 143-7, Adam Shorrocks leading the way with 40 not out. St Annes were then dismissed for 96 in 17 overs as Ryder took 4-17 from his four overs and Damien Hutchison 3-11 off three. Professional Amah Ullah fought to keep St Annes in the match with 35 from 27 balls but the others in the visitors’ top eight could only muster 20 between them. Fleetwood took this momentum into their clash with Blackpool, who had won both matches they had hosted three weeks ago. Blackpool chose to bat and totalled 122-6 as Boyne top-scored with 39 and player-coach Liam Castellas took 3-17 off four overs. Fleetwood paced their reply perfectly to win with four balls remaining at 123-6, professional Neels Bergh seeing them home with an unbeaten 49. It means Fleetwood top south group one on run rate from Blackpool, both having won two matches out of three. The final placings will be determined when St Annes, who are yet to get off the mark, host the remaining double-header on June 17. Lytham couldn’t compete with Liverpool Competition leaders Formby, crashing to a 10-wicket home defeat after being dismissed for 122. A familiar name to Fylde coast cricket followers did the bulk of the damage at Church Road as the former St Annes all-rounder Lukman Vahaluwala took season’s best figures of 6-15 from 11 overs. Lytham were hoping to build on their win at Colwyn Bay but soon regretted their decision to bat on being reduced to 8-3. And although opener Taylor Connell’s 90-ball 30 helped the hosts to recover to 75-4, this soon became 91-8 and Lytham were all out in exactly 50 overs. Sabbir Patel took 3-44 from 18 overs, and although Ben Aitchison was wicketless he compounded Lytham’s frustration as his 14 overs went for just 17 runs and included seven maidens . Lytham then tried six bowlers but couldn’t dismiss either of Formby’s openers, who compiled a winning 123 in 28.3 overs. William Porterfield made and unbeaten 72 from 76 balls, including 13 fours, while Haseem Hameed struck five fours and a six in his 95-ball 48 not out. This fifth win in six games leaves Formby eight points clear in the ECB premier league, while ninth-placed Lytham are just two points above the bottom two. Lytham visited Formby’s Merseyside neighbours Northern on Sunday in the Ray Digman Knockout Trophy and lost in the first round of the Liverpool Competition’s 45-over tournament by 48 runs. They put their Crosby hosts in and Northern compiled 248-8 with stands of 68 for their fourth wicket and 61 for the fifth as Chris Laker and Liam Grey both made 68. Lytham had a fine fourth-wicket stand of their own as Matthew Taaffe (52) and Matt Shawcross (48) put on 78, but from 172-4 the visitors were all out for 200 with 14 balls left as Tomas Sephton took 3-40 and Tom Jones 3-34. The big movers in the Moore and Smalley Palace Shield’s premier division were Thornton Cleveleys, who leaped five spots to fifth after a thumping 10-wicket win over winless bottom club Torrisholme, though Great Ecclestson slipped into the bottom two after a heavy defeat at New Longton. 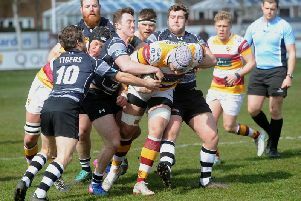 Croston maintained their three-point lead over Longridge at the top after both clubs made it five wins out of six. Standish continued their 100 per cent start in division 1A, while nearest challengers Freckleton increased the gap between themselves and Fylde in third after a 60-run win over their derby rivals. Mawdesley pulled level with Kirkham and Wesham by winning their high-scoring clash, though second-bottom Norcross are still winless. Premier Division: Eccleston (148-5) beat Kendal (147) by five wickets, New Longton (285-7, M Modi 63 ) beat Great Eccleson (64, S Steeple 5-13) by 221 runs, Penwortham (136) lost to Lancaster (139-2) by eight wickets, South Shore (145) lost to Croston (147-7) by three wickets, Thornton Cleveleys (115-0, J Eade 64no) beat Torrisholme (114, J Beech 6-33) by 10 wickets, Vernon Carus (157) lost to Longridge (194-6) by 37 runs.